Well deserved first place, gg man. Thanks! I put a lot of effort into making sure there were a variety of deaths and that they all felt good. What would you say was holding the controls back for you? I just tried it on my old laptop, which runs it like hot garbage. I noticed that there's a huge amount of input lag with lower framerates. Not really sure why that is. I intended to put in a settings menu so you could turn down the graphics for better performance, but I barely got around to putting in a main menu. Thanks for the feedback! I'll have to look into that issue. Nice variety of gameplay elements and I like the possession mechanic which turned out to be quite grim! Neat 3D models too! I guess one comment would be that its not very clear what objects the ghost can jump on, as I was trying to jump on the porta-toilets. Was briefly stuck in the top left corner of that construction stage as well. Its probably quite challenging to make this a 3D platformer as you'd have to consider all the camera-related issues. The sandbox-like nature of the game does mean that you could think of ways of allowing elements to interact to cause chaotic behavior. E.g having something set on fire by the bbq pit running by a bush which is connected to an oil leak from a car, causing an explosion. That's probably also kind of challenging to implement, but still an idea for consideration! 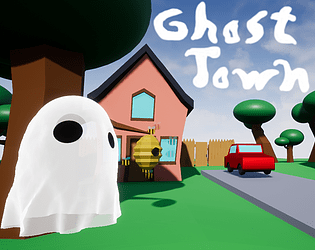 I was a little worried that that inconsistency in what objects were solid for the ghost would be frustrating to players, but I didn't really have a better answer to how to lay the stages out the way I wanted to. In the end, I figured that, since there's no penalty while not possessing, it probably wouldn't make a huge difference if people spend a couple seconds trying to jump on some thing that they can't get on. I think given a little more time, I'd hopefully realize that I shouldn't put thing that you aren't able to jump on next to objects in the environment that you have to find a way on top of. That definitely sends the wrong message. With regards to the bit in the top left, how/where were you stuck? There's an I-beam back there that you should be able to get out on, though I didn't spend a large amount of time testing all the corners to see if there were issues back there. As for interactions between different hazards, I have a million ideas on things to do with that. I just didn't implement any, because it would've been super time consuming and difficult to balance in terms of difficulty. I did want to have the bees spread to other people and the fire spread to other people and wooden objects, but I just never got around to it. If I continue working on the game, I'll definitely make sure to get that stuff in there. And that idea with the oil leak is really good! For that bit in the top left, I dropped in the enclosed area with the lone guy, think I managed to get out of that by some jumping around for a bit, although I couldn't figure out how to get the guy killed. The solid vs non-solid wasn't really much of an issue with some experimentation, although I can see how players that jump on something and find themselves clipping through it might just conclude that its just how the game is set up (as a ghost supposedly works that way), and to jump/interact with something they need to possess someone. There was a pit in the construction zone as well which seemed to block the ghost from moving northwards as well - that wasn't very apparent from the camera angle. Oh and forgot to mention that the app comments were pretty fun to read too, good job on implementing that in the pause screen! Ah, I see what you mean. The I-beam might be a little difficult to see. That guy is intentionally pretty difficult to get to a hazard. He's sorta like that hard mode of that level. Even I can't reliably 100% that level half the time, because it the solution (at least the one I know of) comes down to the last second or two. The pit is intentional, and it's also a hazard that you can dump mud into. I probably should smooth out the north face a bit so you can walk out of it that way like you can with the other sides. Fun game! I enjoyed playing it. Interesting game. Great fun concept that can actually be used for hilarious results. Great job. Loved it! The gameplay is challenging, the idea is super unique, and the "Live Burial" app is hilarious. Thanks for the detailed feedback! I really appreciate it! In terms of giving the ghost more abilities, I wanted to be as minimalist as possible. I might play around with letting him possess objects as well, but I really like the concept of the humans being his pawns. I definitely want to add humans that can expand the depth of the game, though. I've got an idea for a human with a hammer that you can just plop in front of various things (propane tanks, destructible walls, load-bearing columns, etc.). This game is really awesome! Very fun & the music is so catchy! Very addictive game, and super fun, great job! You play as a lonely ghost trying to make friends. You possess humans by jumping on their heads, and you can steer them into inadvisable situations. You only have 30 seconds of possession ecto-juice, represented by the bar at the top of the screen. The ghost cannot interact with the environment or hazards, so you have to possess humans to do things like open gates. Humans that see death get scared and run away (potentially into hazards). When humans are scared, they move twice as fast, which allows you to cover more ground.